This is a custom Buckeyes themed business card holder. Hand crafted from 5/16” Kiln Dried Pine. Business card holder holds standard sized business cards. 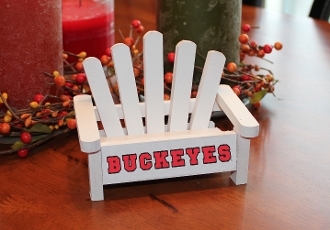 Picture shows custom Buckeyes themed business card holder. Contact us about multiple chair shipping discount or large quantity orders.